The Style 99 has multiple IACS type approvals and is Coast Guard approved. ABS type approvals cover fresh water systems; sea water cool- ing; ballast systems; vents, overfl ows and sounding pipes; potable water systems; and fi re main systems. Plain- end couplings such as the Style 99 are advantageous for retrofi t and repair services because there’s little upfront tooling cost. The lack of extensive pipe-end preparation means the cou- pling can be installed quickly, limiting downtime, which also met Parrotta’s needs. 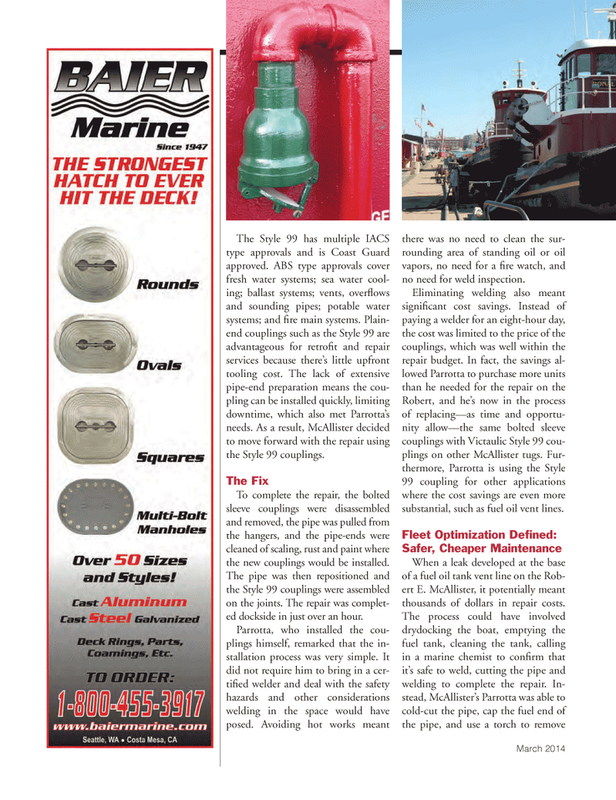 As a result, McAllister decided to move forward with the repair using the Style 99 couplings. To complete the repair, the bolted sleeve couplings were disassembled and removed, the pipe was pulled from the hangers, and the pipe-ends were cleaned of scaling, rust and paint where the new couplings would be installed. The pipe was then repositioned and the Style 99 couplings were assembled on the joints. The repair was complet- ed dockside in just over an hour. Parrotta, who installed the cou- plings himself, remarked that the in- stallation process was very simple. It did not require him to bring in a cer- tifi ed welder and deal with the safety hazards and other considerations welding in the space would have posed. Avoiding hot works meant there was no need to clean the sur- rounding area of standing oil or oil vapors, no need for a fi re watch, and no need for weld inspection. Robert, and he’s now in the process of replacing—as time and opportu- nity allow—the same bolted sleeve couplings with Victaulic Style 99 cou- plings on other McAllister tugs. Fur- thermore, Parrotta is using the Style 99 coupling for other applications where the cost savings are even more substantial, such as fuel oil vent lines. When a leak developed at the base of a fuel oil tank vent line on the Rob- ert E. McAllister, it potentially meant thousands of dollars in repair costs.